Areca palms. Almost as happy as the ones in front of my house. This morning at around 7:30 am after saying goodbye to the kids and BH, I was just about to grab another cup of coffee when the doorbell rang. I looked through the spiffy video surveillance monitor and there was a dapper old man with a Cuban hat. I asked what he wanted...prepared to be greeted by requests for money, to buy books, whatever usually comes. I didn't understand him the first time and asked him to repeat. "Senhora, I am from the Dom Bosco Church and I came here to ask if I can cut some of the palm fronds in front of your house." As you all know, I am not religious and that gave me pause for a moment. And then I realized that Sunday is Palm Sunday. 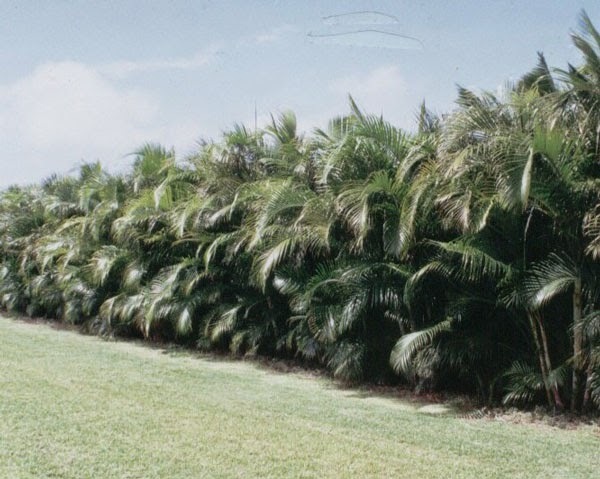 Lining the side wall of our house are many Areca palms with wonderful fronds. He wanted some. I told him to cut as much as he likes. He set his hat back forward on his head, said "thank you" and took a small scissors out of his pocket. And trimmed the trees.